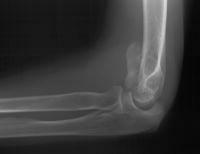 Transcondylar distal humerus fractures are usually high energy comminuted difficult fractures, technically difficult to manage. 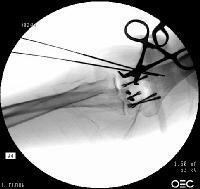 Anatomic reduction, rigid fixation and early motion are desirable, if technically possible. 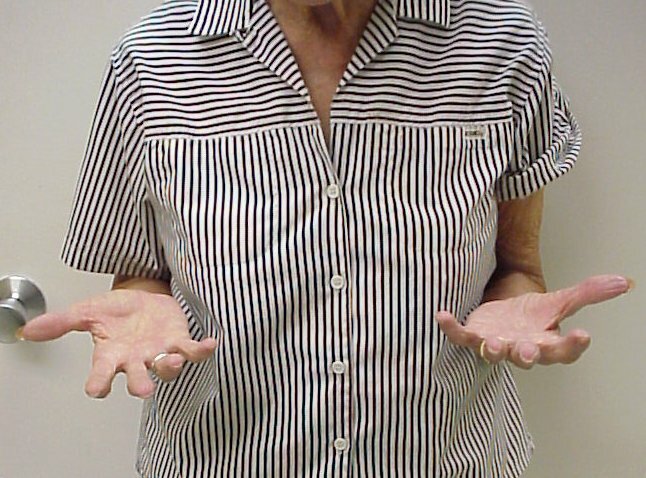 There are a variety of techniques for fixation. 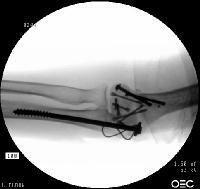 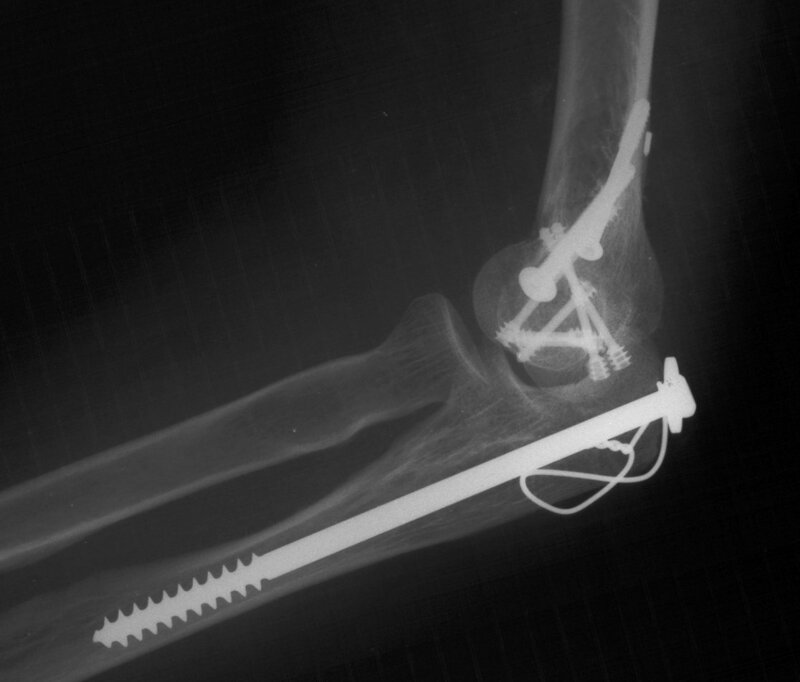 Here, Herbert screws were used to secure the two central purely osteochondral fracture fragments to each other and to the proximal humerus. 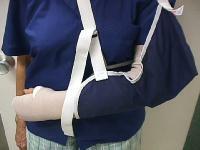 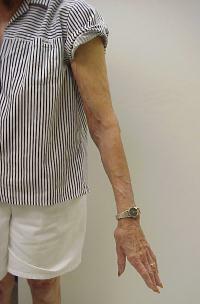 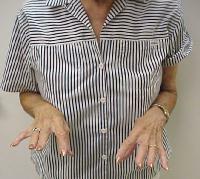 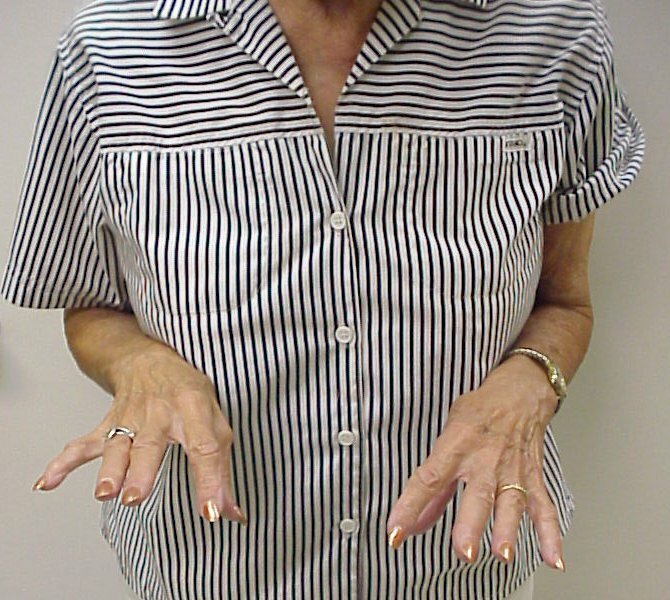 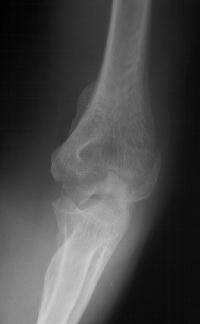 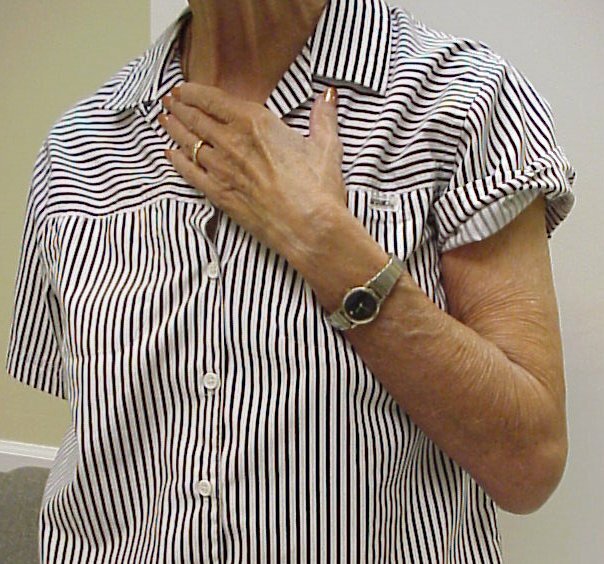 81 year old physically active woman sustained a left elbow fracture in a syncope related fall. 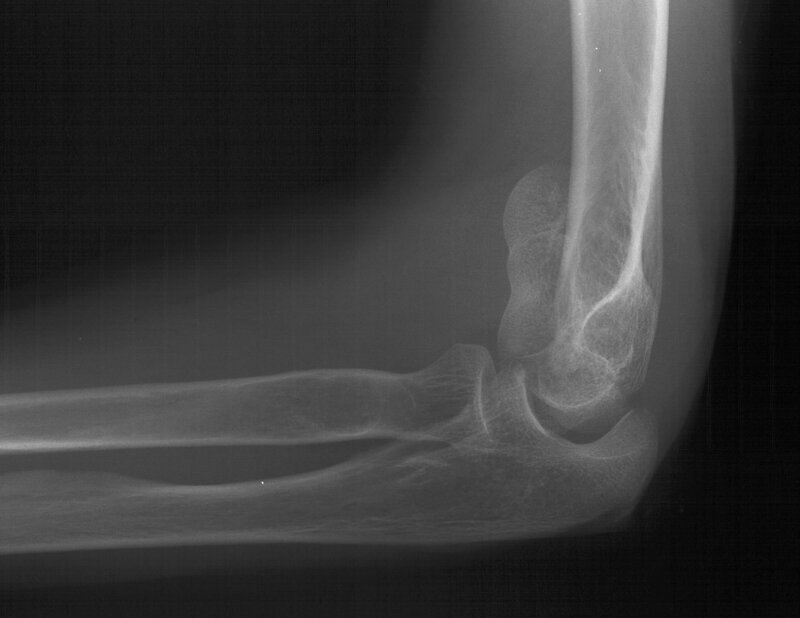 Lateral and central fracture component displacement. 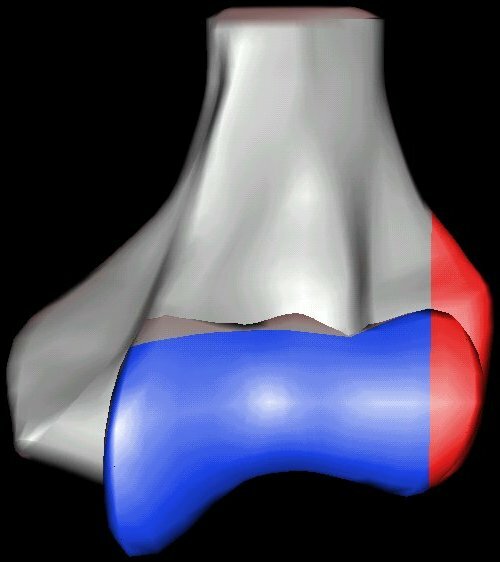 Unusual contour visible at the medial metaphyseal flare. This is seen on the lateral view to be the anterior half of the central articular surface. 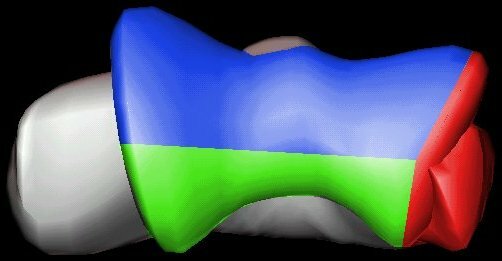 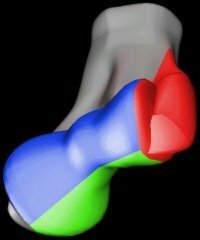 The central column is additionally split into an anterior (blue) and posterior (green) fracture fragments. 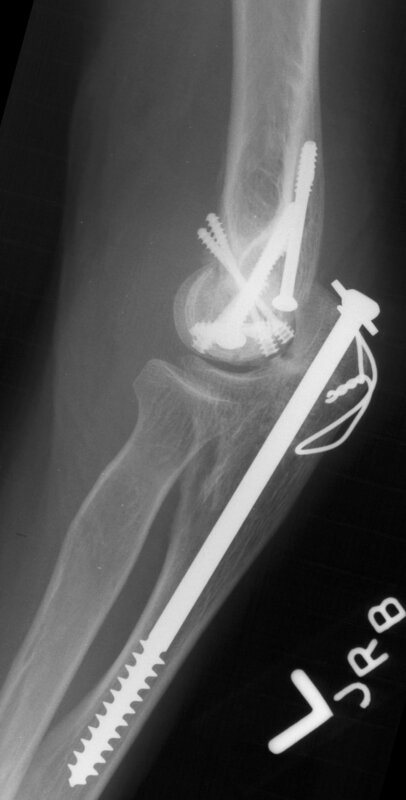 Open reduction via olecranon osteotomy. 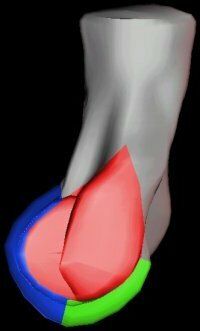 The ulnar nerve is retracted with a penrose drain. 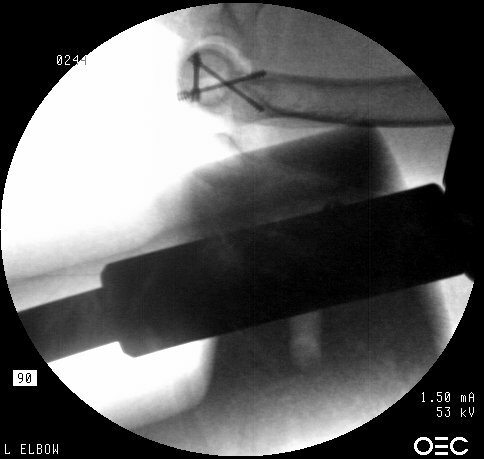 The articular surface was reconstructed, then secured to the shaft. 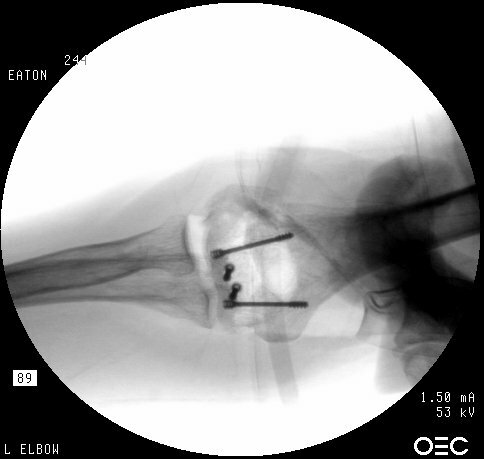 After recovering the rotated anterior articular fragment, the anterior and posterior halves of the central articular component were secured with .062" pins. 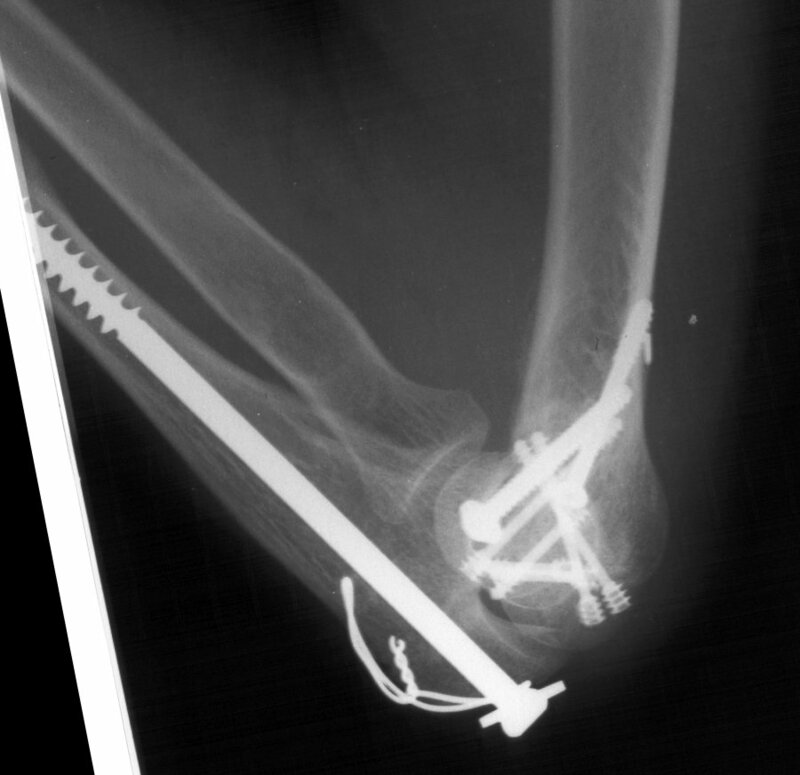 These pins were replaced one at a time with Herbert screws. 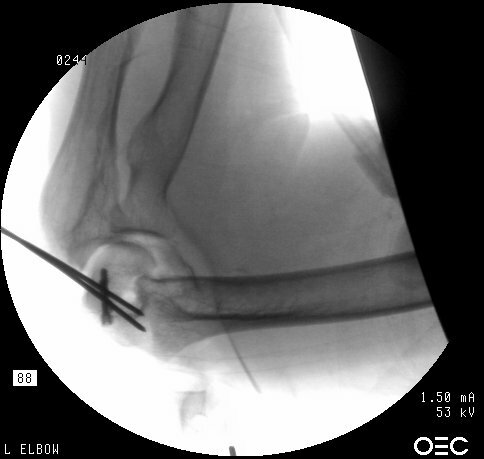 Later in the case, the small medial osteochondral fragment was secured with absorbable sutures (not shown). In similar steps, the reconstructed central articular component was secured to the proximal humerus with pins. 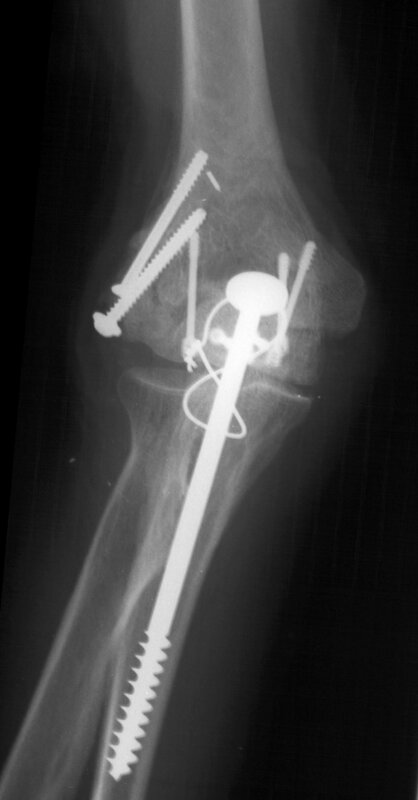 Once satisfactory reduction was obtained (not yet, as seen here...), the pins were replaced by more Herbert screws. 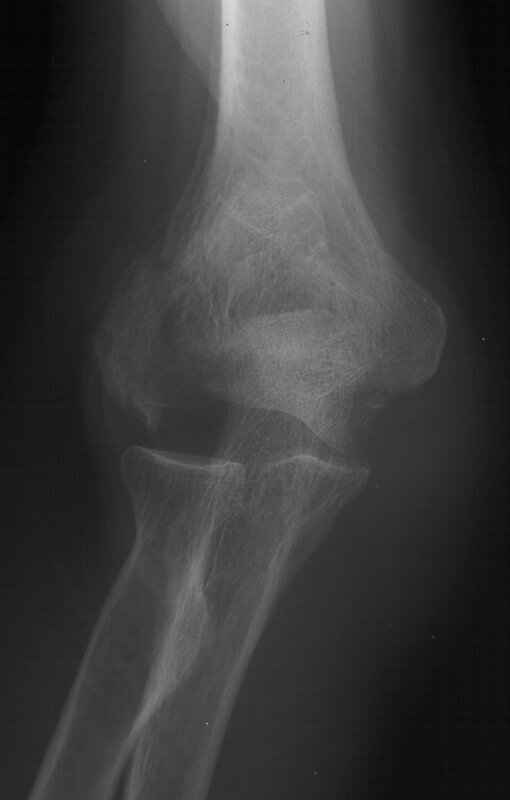 This allowed fixation of the purely osteochondral segments without prominent harware. 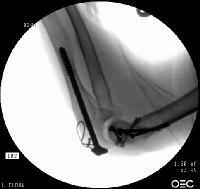 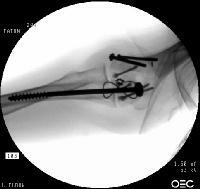 Screws were secured from the central articular component to the more proximal humeral cortices. 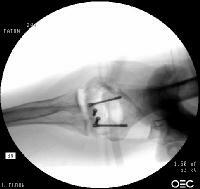 These provided biplanar fixation, eventually with two screws in each direction. The lateral column was then secured with two cannulated screws. 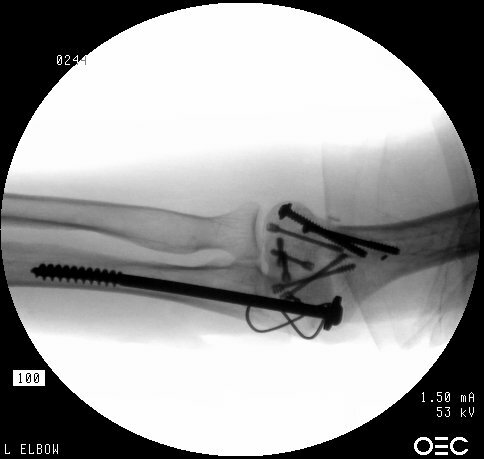 The olecranon osteotomy was closed with a 6.5 mm lag screw and (belt and suspenders) tension band technique. 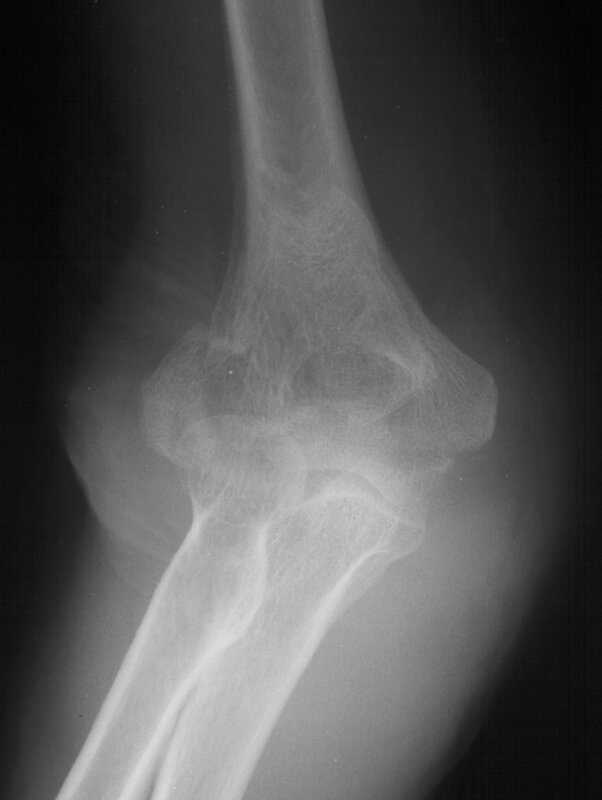 Lateral column not yet fully consolidated on Xray, but clinically healed.